Daily Boater Boating News: Which Way is North? What if I told you that the signal from the GPS satellites reaches your boat with the intensity of a candle – held in Los Angeles while you are in New York…? Yes, that’s how it is designed. So, what happens if the weather really becomes foul? You can lose your GPS signal, that’s what! It takes a lot because of the redundancies built in but it can happen. I know it, first-hand. And if you have to leave your boat due to emergency conditions, are you going to rip your GPS out of your dashboard and take it with you into the raft..? No. As a matter of fact and of safety, right next to my compass, which sits above my in-dashboard GPS system, is a handheld, old fashioned compass. If I leave that boat, the handheld compass comes with me. Most of us have seen diagrams or pictures of magnetic waves, just like those that come out of household magnets, coming out of the North and South Poles, encircling the Earth. The iron core of the Earth spins at high speed and creates this magnetic field. Of interest, the magnetic forces don’t emanate from the top of the world, i.e, the true North Pole. Right now, the “Magnetic North Pole” is just north of Hudson Bay. When George Washington was leading the United States, Magnetic North was near Norway. If you look on any paper chart for the “compass rose”, it shows in the very center what is called “Variation”, i.e., from the area that the chart covers, what is the angular difference, i.e., Variation, from True North to Magnetic North. Here, it is 14-degrees west, i.e., your compass points 14-degrees too far west at Magnetic North versus where True North lies. This means that when your compass is pointing to Magnetic North, you would turn the boat 14-degrees to the east (014-degrees) to be pointing to True North. If you look more closely at the compass rose, directly across from the citation noting that Variation is 14-degrees west, it also says that this Variation is increasing at 2 minutes each year. Well, each degree is 60 minutes and that is starting to add up. We are all using charts based on the “Datum”, i.e., data base, of latitude and longitude data established in 1984. As of this writing, that is 37 years ago. Like compound interest, given enough time, small numbers can add up to something significant. So, Variation has increased by more than a degree. Well, big deal, you say. But for some, this is meaningful. For example, it has caused airports to have to renumber runways. With all that said, more important than Variation to the average boater is Deviation. Deviation is the sum of all the forces within your boat that keeps your compass from pointing to Magnetic North. What? 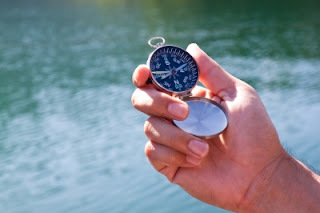 Metallic objects (or magnetic objects like radio speakers) near your compass will “fool” your compass into thinking that that object is Magnetic North. How can you tell what the Deviation is of your compass? Well, if you have a GPS, it will be easy – all you need is mile or so of calm water and you can run down the rhumb lines of the four cardinal points and record the differences between what the physical compass is reading from the GPS course you are running. The difference is Deviation. Of interest, Deviation “deviates” differently at a given compass course so you need to check at least the four cardinal courses (we check 16 in USCG Forces.) You need to know what your boat’s compass Deviation is so that, if you do have to use your compass in lieu of your GPS, you can compensate appropriately. The use of GPS Course Over Ground (COG) is a highly inaccurate method of determining deviation. COG is the vector sum of course being steered, wind and tide or ocean current. A better method is to choose a distant visible landmark, set it in as a temporary waypoint in the GPS and point the bow at the land mark. Note the difference between compass and GPS. This is deviation. Do this with enough points and you can construct a reasonable deviation table. Better yet, hire a compass adjuster to do the work for you and adjust out the deviation in the process. In a wood, fiberglass or aluminum boat, a competent adjuster can get all deviations below 2 degrees. For practical purposes this is nill with a typical 5 degree graduation compass dial.